If you don’t believe monsters are real, ask Bay-Lee. At sixteen, Bay-Lee is an average student. She never raises her hand in class and doesn’t put the right answers on tests even though she knows them. The other kids would be surprised to learn she’s living under an alias as she’s forced to move from state to state, hiding from The Order, a secret society of shifters bent on killing her before she can start to Van Helsing’s school. For some reason the monsters are afraid of her. When a reaper steps out of her closet to issue a warning, she realizes her problems are only beginning. Even as her dream of following in her father’s footsteps to become a hunter draws closer, a dark threat looms over the school. Someone or some thing is killing hunters on their birthdays. If she doesn’t figure this mystery out fast, she won’t make it to seventeen. Her childhood was stolen from her. She’s determined not to lose anything else to the bloodthirsty beasts. Bay-Lee developed a plan over the years. It’s a plan for vengeance, a plan for justice. The biggest obstacle in her way: jungle green eyes. Falling in love at this point could ruin everything. It’s the furthest thing from her mind. Then she meets a young hunter with a past as dark as her own and a bleak future. From the moment they meet he makes it clear he wants nothing to do with her. 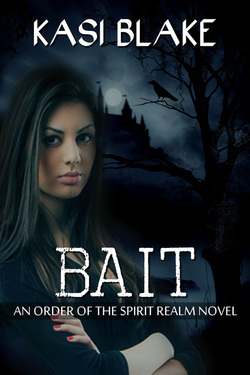 BAIT is the first book in the Order of the Spirit Realm Series. If you enjoy it, follow it up with Hunter, Warrior, and Legend (when it is released). Click below to get a copy from your choice of site. This book continues the story of Nick and Bay-Lee from Bait. It starts with Bay-Lee trying to live a normal life--sort of. I It's impossible to banish the supernatural when your boyfriend is a ghost. Nick says he wants to protect her, but she isn't sure she believes him. After all, she's the one who killed him. Get ready for a rollercoaster ride with plenty of action, suspense, romance, and a touch of humor. This is the third book in the Order of the Spirit Realm series, and we take up two years after we left off. Bay-Lee is training hard and is highly skilled now, but will she be able to survive a battle with the werewolf pack that killed her mom? And what about Nick? He seems to be falling for his new banshee, Keisha. Bay-Lee will have to choose whether to sail away or live life as a hunter. At last, the final chapter in the Order of the Spirit Realm Series. Join Nick and Bay-Lee as they battle monsters, try to survive her father's dangerous plans, and search for two missing loved ones. Mike Keebler is tearing around the world, killing monsters on his own--and some hunters. Is he too far gone to save? And Avery is just missing. What happened to her will shock everyone. War is coming, and Bay-Lee just wants to sail away with Nick on her boat. But they can't leave until they know the people they love are safe. Nick is keeping secrets again. He knows something Bay-Lee doesn't about his situation. There's a chance for him to stay with her forever... as a mortal. But at what cost?